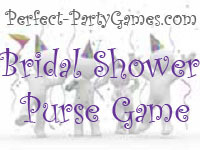 Summary: Bridal Shower Purse Game uses the contents of the guests purses as the basis for the game. Each participant needs their own purse for the game. Print out the list of items and scratch off any items you don't want to use. The host calls off an item from the list. The item must be found in the purse or backpack, not in your guests pockets or otherwise to receive a point. Each participant gets a point only if no one else in the room has the same item. You may also decide to award points for unusual items NOT on your list but in the guests purse. The winner is the guest with the most points at the end of the game.